HGTV features St. Thomas villas on "House Hunters on Vacation"
St. Thomas, USVI, August 16, 2011: Home and Garden Television (HGTV) aired the final episode of its popular spin-off series "House Hunters on Vacation," featuring three villas from McLaughlin Anderson Luxury Villas' St. Thomas portfolio on Monday, August 15th, 2011 at 10:30 pm EST. The show, a spin-off from their widely successful "House Hunters International," chooses a stateside family from a pool of video auditions and surprises them with their dream vacation in a soon-to-be-determined destination. Once chosen, the family is whisked off to their destination and met by show host Taniya Nayak (Host from HGTV's "FreeStyle", "Designed to Sell", and "Destination Design"), who escorts them to three villas offering different amenities from their "wish list," which Ms. Nayak has selected for them to see. Throughout the half-hour segment, the family is filmed sightseeing and visiting popular tourist attractions such as Coral World, Mahogany Run Golf Course and world-famous Magens Bay. The family must choose their favorite villa by the shows end, and is later filmed enjoying their vacation in the villa they liked best - all expenses paid by HGTV. HGTV is no stranger to the United States Virgin Islands, as they have chosen these beautiful islands for several previous episodes of "House Hunters International" and more recently, "Bang for your Buck" - which compares three recently-remodeled homes to see which homeowner made the best use of his renovation dollars. Choosing St. Thomas for "House Hunters on Vacation" was a "natural fit," said the show's Producer, Carrie Jensen, who scouted the location many months prior to filming. Ms. Jensen's colleague and Field Director, Laura Patterson, has filmed in the USVI on several occasions for HGTV, and recommended that the season finale be filmed on St. Thomas. Other destinations included Hawaii, San Diego and Key West. McLaughlin Anderson Luxury Villas on St. Thomas has been offering top rental villas since 1985, and has long been recognized by top travel publications such as Conde Nast Traveler and Caribbean Travel and Life. Fortune Magazine named McLaughlin Anderson one of the "Top 25 Villa Rental Companies in the World." St. Thomas luxury villas featured in this episode are Banana, Indochine and Casa Lupa, which can be viewed on the company's website: www.mclaughlinanderson.com. Owner/Broker Nancy Anderson of McLaughlin Anderson Luxury Villas said that "vacation rentals are the fastest-growing segment in world travel," and that "network television is at last showcasing the ease, comfort and seclusion of a private villa rental." McLaughlin Anderson represents over 100 private villas and estates across 7 islands in the U.S. Virgin Islands, British Virgin Islands and Grenada, West Indies. Anderson went on to say that "design and travel shows are turning more to vacation rentals to reveal the tremendous value in renting a beautifully-designed and completely equipped private villa for vacationing with family and friends. HGTV's feature of St. Thomas will no doubt pique travelers' interest when they see how captivating our islands and villas are!" 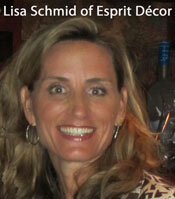 Local decorator Lisa Schmid from Esprit Décor, LLC, served as the show's Staging Expert for all three villas, and Kelly Kendall was hired as a local Production Assistant by HGTV. "House Hunters on Vacation" airs on Monday nights at 10:30 pm EST, right after "Design Star." HGTV is broadcast on Innovative Cable's Channel 141 and on Channel 112 through Dish Network.